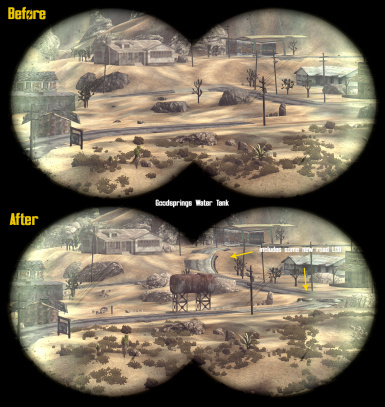 Adds new distant level-of-detail to many world objects; from vehicles, roads, barricades, and lots of rocks. Permission is granted for the "Main File" of Much Needed LOD to be used as a modder's resource in the creation of new areas and worldspaces. In this context no credit needs to be given. Textures used in the NMC patches were originally created by NMC. Textures used in the Ojo Bueno patch were originally created by tapioks. Electro-City originally created by MyGoodEye. Adds new distant level-of-detail to many world objects. 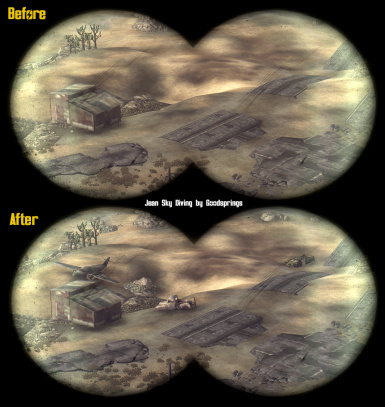 For example, cars, trailers and trucks can now be seen from a distance. Among other LODs in this mod are rocks. I tried to create low poly impostors for almost every single rock that dots the landscape. 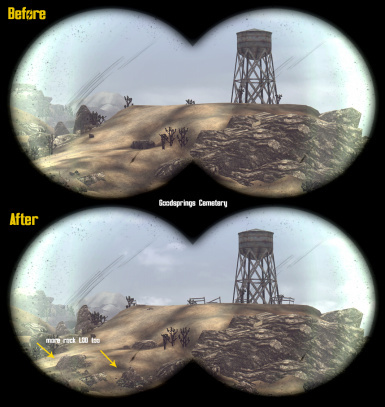 This mod must be used with the FNVLODGen Utility to generate your landscape LOD. Don't bother using this mod if you're not going to use it with FNVLODGen. I highly suggest using this mod with FNVLODGen Resources, as well as LOD Additions. Available is a texture patch for users of NMC Texture Pack﻿. Install on top of Much Needed LOD, overwriting any files. Available is a texture patch for users of Ojo/Poco Bueno. Install on top of Much Needed LOD, overwriting any files. If you use the mod NMC LOD Texture Patch, have it overwrite/override Much Needed LOD. Enable the mod in your load order, including .esp file. As with most LOD mods, give it high priority. 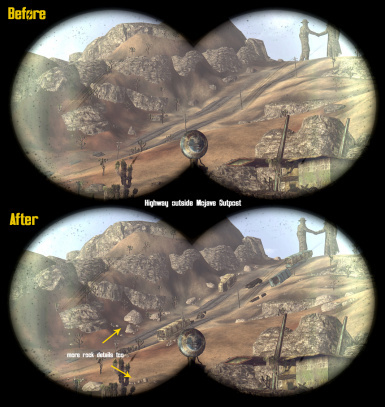 Run FNVLODGen to generate the new LODs. 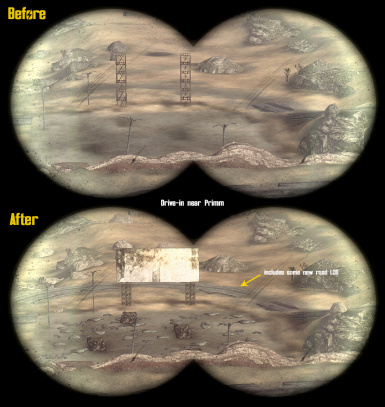 NOTE: making use of each update requires regenerating the LODs. If after you generate your LOD and many distant details refuse to show up, check if you have landscape texture packs enabled during the generation process. Some of these packs contain their own LOD texture atlas. Delete or hide these atlases and redo FNVLODGen. Another explanation is that these packs sometimes (rarely) contain LOD textures that are simply too big. When in doubt, disable texture packs (that affect the landscape) in your load order when generating your LODs. Re-enable after. Do note that the engine has a vertex/poly count limit for world cells. Thus, it's frustratingly routine for some LODs to not appear in crowded locations. All the Before screenshots were taken with FNVLODGen Resources and LOD Additions. 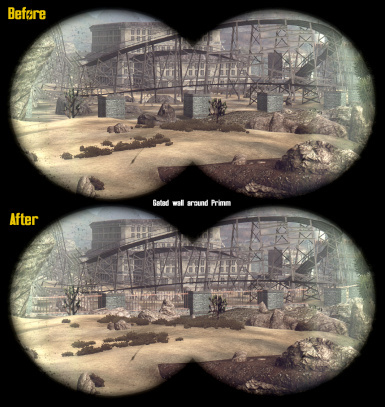 Same applies to After, but with Much Needed LOD enabled. Much Needed LOD covers some rock assets that FNVLODGen Resources also covers. Much Needed LOD contains rock assets used in Quarry Junction, near Sloan. Just a heads-up for those who use the Limestone LOD mod. Not all vehicles are covered. 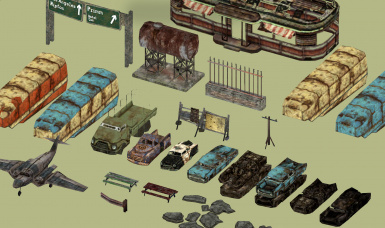 I only created LOD for the most common vehicles. Likewise, non-static vehicles (the ones that can explode) are not considered static and are thus not generated for LOD.